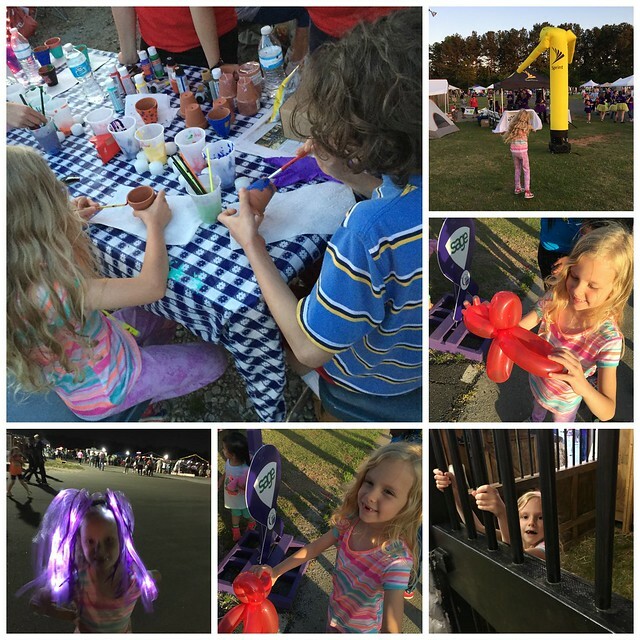 We went last night to the Relay for Life event at the Fairgrounds. It had been a few years since we went to this, but we had such a good time last time and we had nothing going on so we decided why not go check out the fun. 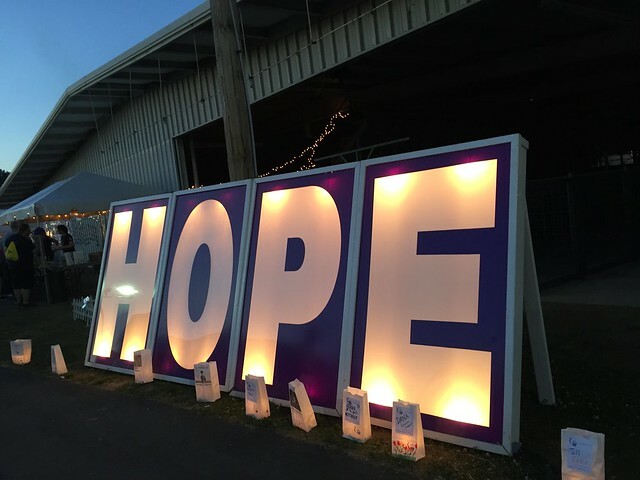 Our Relay for Life event is really amazing. It's the only one I've ever been to, and it's like this incredible festival on steroids. People are singing, and dancing, and celebrating. There are games and gifts and just this undefinable JOY in the air. You see hugs, you see tears, you see people walking around in silly costumes and just exuding their happiness and giving it out to others freely. This thing is the largest in the world. That rather explains A LOT. 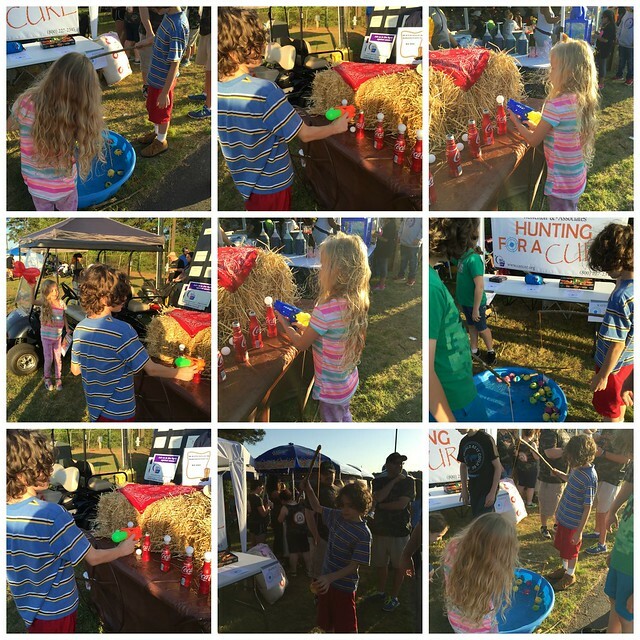 What makes it really wonderful is how all of the booths have activities, little games and things for the kids who are too small to understand the "bigger" meaning of the event, but these things still create a positive association for the event that I think is important. We didn't scratch the surface on the activities that were available to do, for sure. But we are many and it's hard to wrangle us through stuff so I think we did ok. 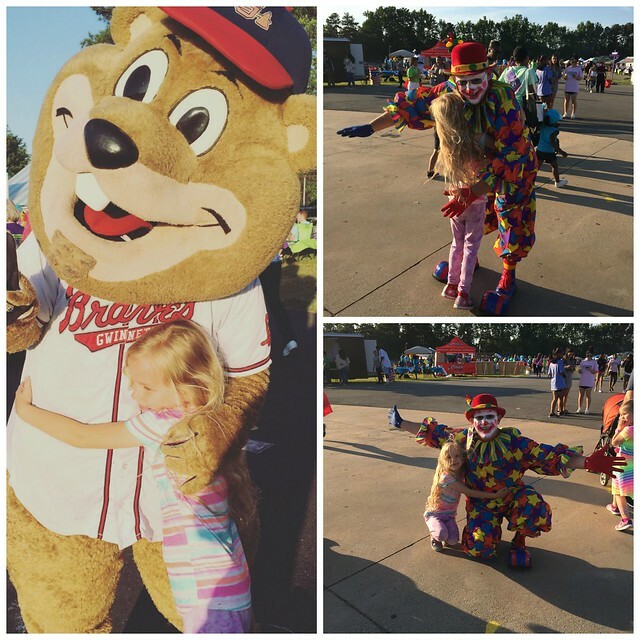 There were clowns to meet and even Chopper was there, our old friend from the Braves games. 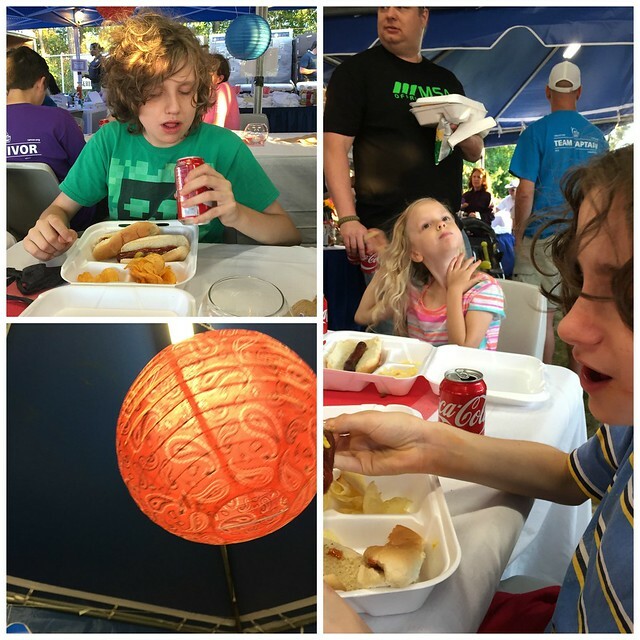 We had some BBQ and hot dogs under a tent with Chinese lanterns and enjoyed the warm southern evening as night fell. It was al fresco tent dining at it's finest. Yes Charlie is in love with that Coke. It's such a juxtaposition, to be surrounded by all the luminaries in memory of those who died from the various kinds of cancer but to feel so much happiness. 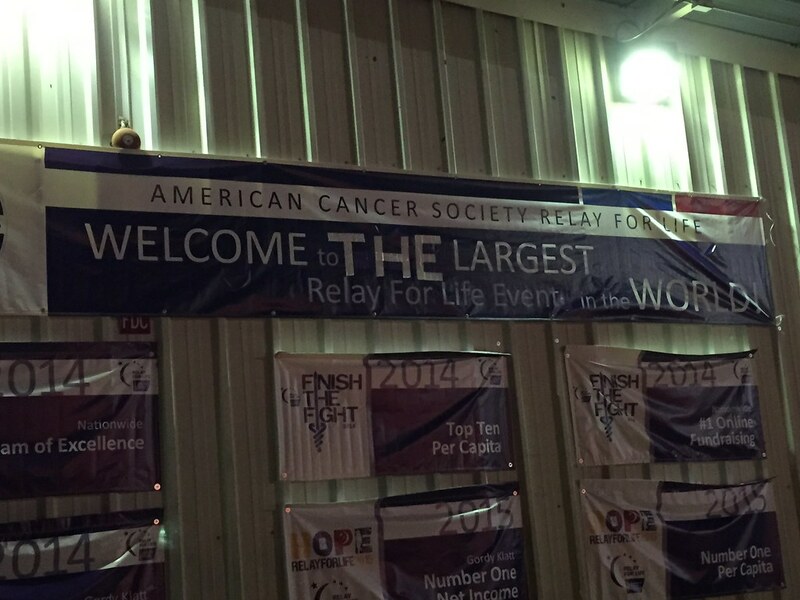 Maybe that's really the point of Relay for Life. It's not just here to remind us to celebrate the lives of those who didn't make it or who are still struggling with cancer, it's also to remind us to celebrate ALL of our lives. Celebrate even on the days that seem crappy. Celebrate when things aren't going the way you want. I heard someone say, recently, upon hearing that I had four children "Oh - you are so rich." Julia echoed it as we ate our dinner, "We're rich." She was saying this because we had both coke AND cookies with our dinner I think. The truth is, we are. We're SO rich. We're filthy rich. We will never have all the money or all the things or the best house or the best car. But I don't really care about any of that. What I have is the most important stuff in the whole world. I woke up today feeling tired and achy and I'd like a nap, on the beach preferably. But since that isn't happening I should also note that I woke up happy, and in love with my family. Life is really good. I feel like I soaked up so much good energy at Relay For Life that I'm good for a long time. Just beautiful Gidge. The best reason to relay of all!